The Prophet: Look at yourselves. Unplug from your chairs, get up and look in the mirror. What you see is how God made you. We're not meant to experience the world through a machine. Courtesy of SmartSound Software, Inc.
Q: If this is in the future, why are there only contemporary vehicles? Q: Why was crime reduced so much? Q: Would all the restaurants and bars be closed if the surrogates don't eat? As with most films, the trailer made this look like it would be something good – an action movie with an interesting sci-fi concept behind the world created for us. For this reason I was a bit surprised to see the "finishing time" of the film being listed as barely 90 minutes after the start time because I thought it would be hard to do all the things that the trailer proposed in such a comparatively short time. Leaving the film at the end, I found it easily fitted into the 90 minute time period and sadly it achieved this by not actually doing a great deal that I had hoped it would. The plot sees us in a world where the majority of humans live their lives from the comfort of their homes, experiencing life through the android clones (surrogates). Although pockets of humanity have banded together to resist this, generally they are seen as weirdos rather than having any sort of point. Due to the surrogates, accidental death has been nearly eliminated while crime is at an all-time low. However when the destruction of a surrogate leads to the death of the user, Detective Tom Greer is assigned to the case – a case that becomes even more high profile when the victim turns out to be the son of the creator of the surrogacy system. The potential is there in the plot and the various things they put in around it (Tom's marriage, the loss of a child etc) but it doesn't really deliver on much of it. The subject matter isn't really that thought provoking, partly because it doesn't hold out a lot for consideration by the viewer but partly because the film doesn't even seem happy with its own world creation. The whole idea is full of holes to the point that the film can't hide them or distract from them for very long and you get the sense that it is rushing a bit before it all runs out through its cupped hands. This is a shame because it niggles the whole way through and becomes worse whenever we see what surrogates can do (their speed, strength etc) because you wonder why the world looks the same as it does when full of "normal" people. Outside of this though it is still an action film of sorts so one hopes for thrills of that side. Unfortunately this doesn't really spark either. 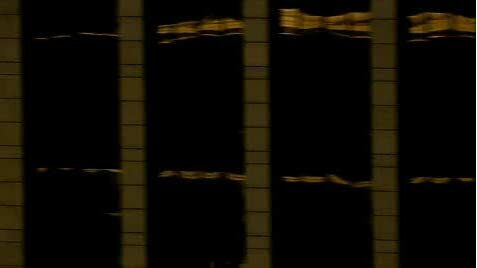 The running/jumping effects are not perfect and the scale of some of the action sequences means that some come over as being remote and not engaging or thrilling – a bit like watching someone else playing an video game that you don't really care about. It isn't bad though – the effects do still work, the action is still noisy and the plot is decent enough to at least not irritate – but that is the sort of level of film we're dealing with, one where my "praise" of it includes me saying its not too irritating! The performances sort of match the patchwork feel to the world and the film – it doesn't seem to be sure of itself and neither are they. Willis does his best (despite the wig etc he has to wear) but doesn't manage to balance the action with the character stuff and, thanks to the material, doesn't really deliver on either. Mitchell is so-so, as is Pike, while Cromwell essentially dials in a character he has sort of played before (but it made sense in other films) and Rhames is just plain odd. 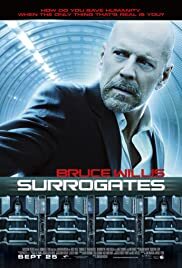 Surrogates is not an awful film – but it is a distinctly average one thanks to the amount of things it half does. Whether it is the action, the substance, the effects, the performances or whatever, it all appears to be "OK" but never pushing for more than that. Improved focus, a stronger script and a longer running time could have made this a better film but ultimately it was just average.